All puns aside, you might be wondering "Whats Cusco like?". To give you a sense of Cusco, imagine San Francisco without the skyscrapers and take away the coastline. It is extremely hilly and you need a light sweater in the evenings. 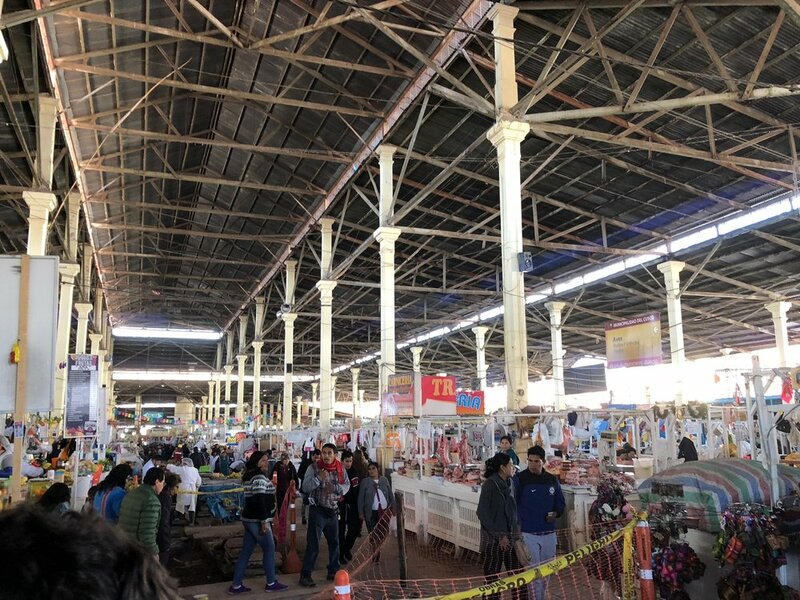 The buildings are colored with red adobe bricks, cream colored plaster, and the corners are littered with street art vendors. Cusco center there is the most “touristy” section. In that area the streets are filled people selling tchotchkes and locals trying to get you to pet their baby llamas for a small fee. Moving in Groups & Deciding Where to Go. My group had a blast walking around Cusco and visiting a few choice places. Within my group of 20 participants we naturally broke up into smaller friend groups of 3-5 people. As a leader, this was a huge advantage for me because moving in large groups around an unfamiliar city is hard. It's simply not logistical in groups of 20 people. when you do split up, establish a logical meet up time. Logical times to meet up would be like dinner or when your guides tell you to be back by. If you are the leader, don’t try to force everyone to do the same thing. Sometimes people signed up with their friends and want to just do stuff with them... just leave them be. You can’t force it. Also if you are participant, be welcoming and invite everyone to join you when you go out. Getting to know everyone makes the hike that much better. Contradictory to previous my advice, my group unanimously wanted to do the same two things during the larger chunks of our free day in Cusco. 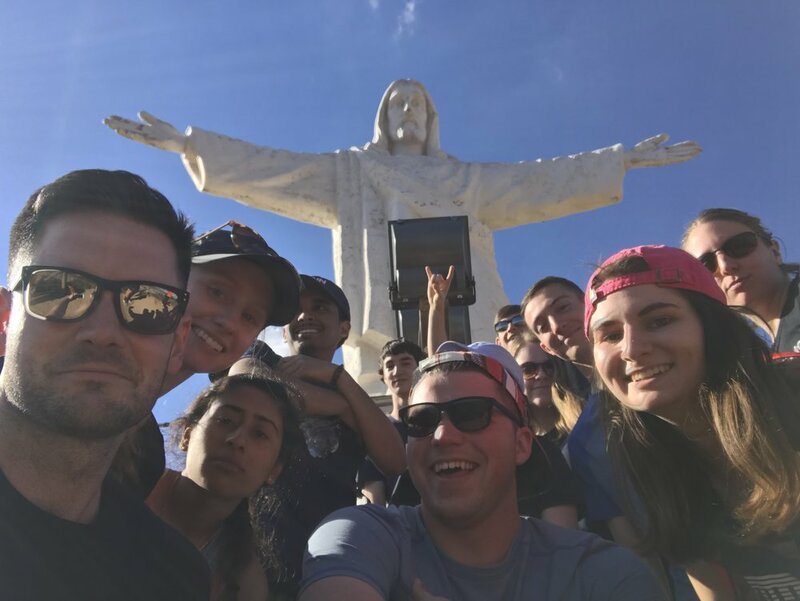 During the morning of our free day, we followed our "In Country Operative", Leo, up to the Cristo Blanco Statue of that overlooks all of Cusco's rolling hills. What a view! This is an easy hike and a great way to test yourself at higher altitude before you start the trek. I am fanboy when it comes to markets. They are just so cool. Maybe it's because I am a business major who loves seeing people bringing their small business to life. Even if you aren't a business major, regardless of who you are you'll love checking out San Pedro. It is pretty crazy place. You can find anything from pig heads to hand made sweaters. Cusco is massive, but your hostel will put you at this is hub of activity. 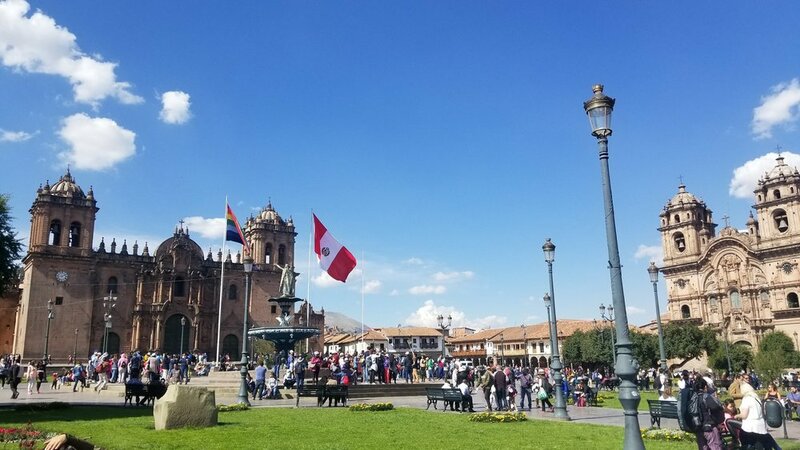 The Center of Cusco is very busy during the day. A lot of the city, especially in this area, has be built upon walls put up by the Inca's and rebuild by the Spanish who conquered them. The center is one big square lined with some local and major American businesses. Most of the city is not like that however. You can easily take a quick left or right down the next street and feel so far away from home. At the same time, I found it intriguing that you could find a KFC, McDonald's, or Starbucks built into the architecture which preserves the history and culture of Cusco. This part is a hot tip for anyone taking on this challenge with a loved one. Like most pictures, this does not do it justice. Maybe turn up the brightness on your computer & turn on "City of Stars" from La La Land to get the imagination going. If you are looking to take some one special to share a view here is what I would do. Go to Cusco square at night, after dinner, then hike up to the water fountains located up the road that starts to the of KFC to get a spectacular view of the lights across the hillside. Looking back at the hills will be a moment to remember. Hit me up on instagram @uconncachclub. I'll be running the Choose a Challenge Club from the University of Connecticut next year.